A game in which the Mariners should have won for multiple reasons. One, Felix Hernandez was on the mound and he pitched an excellent game giving up just 1 run through 8 innings of work. He gave up just 1 run on 5 hits with 9 strikeouts. Another performance wasted as the Mariners had another night of doing absolutely nothing with runners in scoring position. The scoring began on a Miguel Olivo homerun in the top of the 2nd inning. Another hit for Olivo gives him an 8 game hitting streak and proves heis coming out of his slump. In the bottom of the second, Tampa Bay answered back with a run to tie the game and that's how the game would stay until the 11th inning. In the ninth, the Mariners had every opportunity to take the lead as Kyle Seager hit a one out single and was replaced by Munenori Kawasaki as a pinch runner. Olivo came up and singled to right field and moved Kawasaki over to 3rd base. Then, with Michael Saunders up to the plate, the same Michael Saunders who hit the grand slam the other night, was asked to lay down a squeeze bunt. Kawasaki came running in and was tagged out as Fernando Rodney scooped the ball back to the catcher who swiped the tag at the plate. Saunders hit the ball back to the pitcher and the squeeze failed. Of all people to try and pull off a squeeze, why would you do that with Michael Saunders who has the ability to hit the ball in the air and far enough to score the run? Was it less risky to try a squeeze? I love the play, I love that we tried it, but I think we made a huge risk and it didn't pay off. Tom Wilhelmsen came in and pitched a terrific 9th and 10th innings and was the pitcher of record when Jesus Montero led off the 11th inning with a solo homerun to opposite field. Montero was the hero, taking the game to the bottom of the 11th and looking to take the M's back to .500 as they finished off April. Yeah, that would have been great, right? Instead, closer Brandon League came into the game and had trouble throwing strikes once again. Falling behind hitters and allowing them to wait on the fastball and hit it at their leisure. The bottom of the 11th League allowed a leadoff double to Luke Scott, pinch runner Jeff Keppinger moved to 3rd on a Matt Joyce flyout. League got ex-Mariner Chris Gimenez to ground out to third for the second out and it looked as though he would get out of the inning. But, B.J. Upton came to the plate. Upton hit a blooper into right field for a single, scoring Keppinger from 3rd and tying the game. DANG YOU LEAGUE!!!! Talk about irritating, League, destroying a beautifully pitched game in extra innings. As if that were not bad enough. Eric Wedge decided to reward League with the opportunity to pitch the 12th inning as well. Here you go League, you couldn't get it done in the 11th, let's try another inning. Not a smart move, when does League pitch more than one inning? Oh yeah, NEVER! Here's how that worked out for Wedge... With one out, Ben Zobrist walked. Yeah, a walk in extra innings is always good. Next, Carlos Pena singled and runners were on first and second. Pitching change? No, let's stick with our closer, he'll close it out. Elliot Johnson, who came into the game after Evan Longoria left with a bum knee, came to the plate. Johnson hit a line drive to Chone Figgins in left and Zobrist scored from 2nd base. M's lose, M's lose, M's lose! If there's one thing that Eric Wedge was right about, League did close the game. He took the blown save, he took the loss and he took his entire team to 2 games below .500 and a three game losing streak. He spoiled an epic homerun by Montero which really is a heart breaker and just simply isn't doing his job. 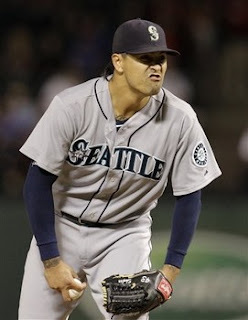 To make matters worse, Miguel Olivo left the game with a pulled groin which may land him on the DL. After he just got things going again it's really hard to see him getting practically carried off the field with an 8 game hit streak. No matter which way you look at it, there were things done wrong today. Wedge has disappointed me once again and League has too. Mainly, Eric Wedge has to see that there were some absolutely ridiculous decisions made this game. This one is tough, really tough. There is no way we should have lost this. Now we move on to 3 more games against the Rays and we have already used our ace and Vargas pitched yesterday. 3, 4 and 5 pitchers against one of the best teams in the league? Not too happy about giving this one away. It especially makes me miss Brandon Morrow at this point in time.